Everyday we take in toxins from our environment by inhaling them, ingesting them, or coming into physical contact with them. When these toxins aren’t eliminated, they can cause irritation or inflammation on your body. 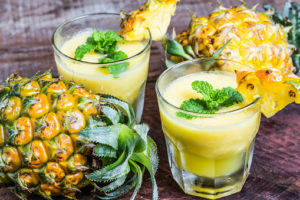 Juices and smoothies are an excellent way to help your body detoxify from this huge amounts of toxins it receives each day. 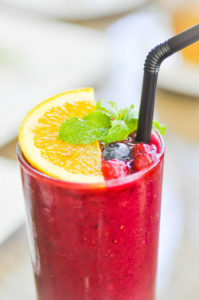 In PC Greens, we offer delicious organic juices and smoothies that will help enhance your well-being. These juices are made from natural and organic products that will give your body a quick health boost. Fresh vegetables and fruits in a juice are a very valuable addition to your diet. Juice have a high fiber content, which provides a lot of nutrients for your body. This might help if you are looking to lose weight, reduce calorie intake, and overall detoxify your body. It can also help you reduce blood sugar levels and can affect your mood and overall energy throughout the day. By taking fresh organic juices every day, your risk of high blood pressure, heart disease, and cancer can reduce. By drinking juices, you will take your daily does of vegetables and fruits in a convenient and incredibly delicious way. This will strengthen your immune system and give your body all the vitamins and nutrients it needs daily. Some of the most common fruits and vegetables used in juices are apples, beets, carrots, and celery. Apples are an excellent source of fiber. It improves your digestion and helps in appetite control. It also helps reduce levels of cholesterol and is rich in many vitamins such as A, B1, B2, B6, as well as in mineral content. This is incredibly beneficial for your skin, hair, and nails. This is an excellent way to maintain your self healthy on the inside and outside. Another important aspect of apples is that it makes you more resistant to disease. By making your immune system stronger and healthier, your body will not get sick often and can prevent different illnesses. Beets are another excellent element that is commonly added to juices. Beet juice has high amounts of vitamin A, C, and K. It is also high in minerals, such as calcium. Beets help your liver detoxify and give your body all the nutrients it needs for a healthy living. It also helps increase your brain function, heart, lungs, and kidneys. Beet juice is crucial for a healthy lifestyle and diet. Carrots are another powerful vegetable that has great benefits for your body. This include making your skin healthier and look younger, as well as prevention of cancer. It improves your muscles and reduces your risk of heart disease and high blood pressure. Studies on carrots have shown how a daily does of them help reduce the risk of lung cancer, breast cancer, and help improve your eye-sight. Celery is an excellent source of vitamins and nutrients. It includes vitamins such as B1, B2, B6, and C. It helps reduce blood pressure and helps relax your muscles and regulate your blood flow. Organic juices that include celery are filled with nutritional value that should be included in your daily life. Celery also contains high content of organic sodium which is crucial to neutralize acids in your body. This helps you be more hydrated and makes your body feel and be healthy. Fresh juices rapidly supply your body with health-promoting enzymes, vitamins, minerals and different nutrients. This gives your body an infusion of optimizing nutrients as well as helps you body break from toxins that contaminate your body. Juices serve a powerful purpose in your body. Each one of our organic juices has been thoughtfully chosen with different healing and detoxifying properties. Besides our already made products, we also offer made to order juices from your choice of fresh and organic produce. Come and taste the difference.